Score big with friends and family alike by planning a champion game night. This easy, inexpensive get-together not only promotes family bonding, it encourages focus, turn taking and resilience as well as vocabulary, math and motor skills. Game on! Make it a standing play date. Think book club, only for families, and well, without books. It’s basically family date night: Families take turns hosting — once a week or once a month, say. You may want to limit it to just two or three families, depending on their size, so everyone can play a game together, or you may want to invite more families and get two or three games going at once. You can even designate a kids’ table and an adult table so kids can play their favorites while parents play more complex games. Designate it BYOG (Bring Your Own Game). When everyone shows up with a game, guests have their pick of what to play. Schedule around your gamers. Check kid naptimes and bedtimes to find a sweet spot that works for everyone. Sunday late afternoon into early evening (say, 4:30 to 6:30) often works well. Would You Rather is a great icebreaker to play as you wait for people to arrive. Blocks can also be fun before the main games begin — set some out and let guests practice stacking them to build the highest tower. Q’s Race to the Top is not only a blast for kids ages 3 to 9, it also teaches them social and emotional skills. And parents love learning more about their kids as they play! Cards are a popular choice for all ages, whether you play Go Fish, Memory, War or Crazy Eights. Set out plenty of chairs — or a picnic blanket. Gather everyone round the dining room table if it’s big enough, or spread out a big blanket in the living room and eat and play on the floor. Serve no-mess finger foods. Think chicken fingers, pizza, pretzels, string cheese, cut-up apples or veggies, cookies — anything guests can snack on with one hand while they play. Make it potluck. When guests all bring something, it’s a win. 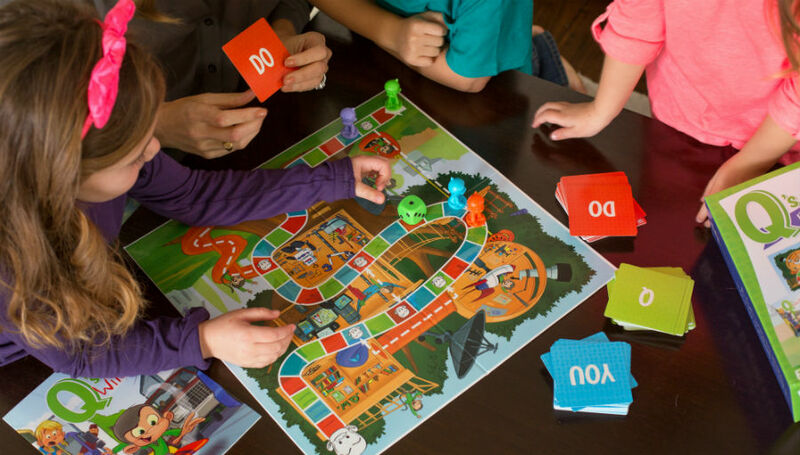 That way, everyone can focus less on game night prep and more on game night fun! Break out Q’s Race to the Top and ace game night every time!